The Acrolite 1C is a higher performance version of the Acrolite 1B. While the fuselage and general configuration is identical, the wing panels have been shortened to eight feet for an 18 foot wing span and a total of 120 sq. ft. of wing area. The horizontal tail volume has been decreased accordingly and the rudder area has been increased. The builder has the option of building the wings of wood or aluminum and of using a GA30U-212 semi-symmetrical section or a GA30U-012 fully symmetrical section for better aerobatic performance when using the higher horsepower engines. For the best performance the recommended engines are the four cylinder Rotax 80 hp 912 to the 115 hp 914 or the 80 to 120 hp. 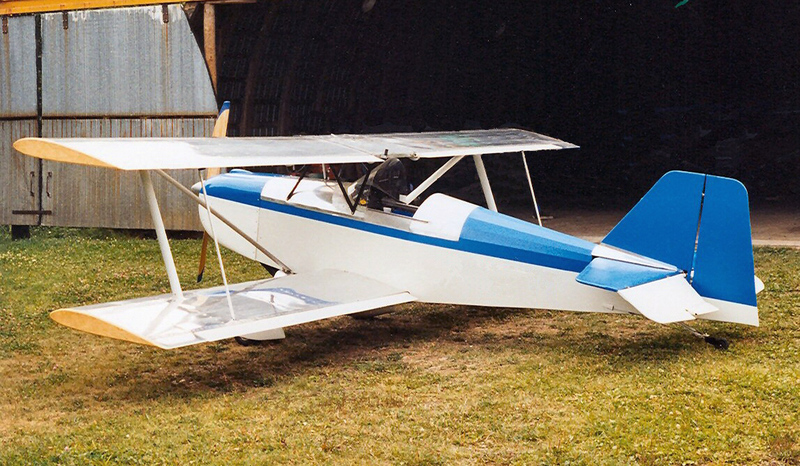 Hirth F30. Other engines of similar power and installed weight can also be used. The converted Volkswagon engine or the small four cylinder Continental engines are not recommended as the extra weight would cause a weight and balance problem and the power to weight ratio would not be as good. The aluminum wing is of stressed skin construction with a box section main spar, a channel section rear spar and strut braced. It is built entirely of 2024-T3 aluminum, fully sheeted and flush riveted with 1/8 inch diameter stainless steel blind rivets. The wood wing uses a built up main spar and ribs, is plywood sheeted and fabric covered. The ailerons are full span aluminum tube, static balanced. The fuselage is constructed of welded 4130 chrome moly steel tube. Control linkages to the ailerons and elevator are push-pull rods with bearings on each end. Rudder and steerable tailwheel control is via a common cable. The tail assembly is constructed of 6061 aluminum tube riveted together with 2024-T3 aluminum gusset plates. The fuselage, empennage and ailerons are fabric covered with 1.7 oz Polyfiber fabric. The landing gear is one piece spring aluminum clamped and bolted directly to the bottom of the fuselage with four bolts. The wheels and tires are 500 X 5 aircraft type. Due to the higher output engines hydraulic operated disk brakes are recommended. The aircraft is conservatively stressed for a limit load of 6 G positive and 4 G negative with a 1.5 safety factor at a flying weight of 750 lbs. The Acrolite 1C we have presently under construction is an effort to explore the performance envelope a little further. We have installed a 150 hp snowmobile engine in it. This is a technically complicated process and not for the faint of heart. We do not recommend anyone do this unless they are prepared for a lot of development work. The engine is detuned to 120 hp and a new experimental reduction drive has been mated to it. The intent is to test the airframe performance with very high power to weight ratio (less than 6 lb per hp). The engine is installed in the airframe and we are now performing run up tests.